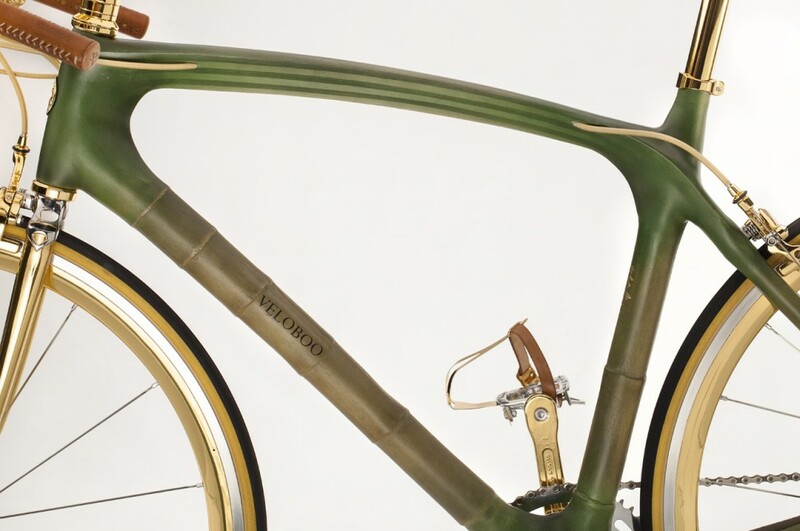 Veloboo gold bike should certainly stand out from the crowd with its gold-plated components, bamboo frame, and £27,000 price-tag. We’re lucky enough to have a few expensive bikes kicking about the Cycling Weekly offices, with the £5,999 Focus Izalco Max 1.0 and the £7,000 Merida Reacto Team E being the priciest things that we’ve been able to get our grubby mitts on recently. However neither of these has anything on one of the stars of the recent Like Bike show in Monte Carlo: the £27,000 Veloboo gold bike. The first thing to say is that to stop this 27 grand bike also weighing about 27kg, nothing on this bike is actually made from solid gold. The frame constructed from bamboo, which may not be a classic material for building bikes, but is incredibly strong and good at soaking up road vibrations, while the fork is stainless steel. In fact most of the components are similar pieces of kit to what you’re running on your bike right now. The wheels are from Fulcrum, groupset from Campagagnolo, and saddle from Selle Italia. However that’s where the Veloboo gold bike veers off from the ordinary. Pretty much the whole groupset and all of the pieces of finishing kit are plated with 24 carat gold, and we’re a particular fan of the gold-plated Campagnolo brakes and chainset, although, given the price-tag, we doubt they’re going to be hitting mass production anytime soon. Finally the saddle and handlebar grips are made from premeium leather, which is specially producted and hand sewn for Veloboo. Fancy having a £27,000 Veloboo gold bike as the training bike or commuting hack? Well you better hurry, as only 30 are going to be produced.